It hurts to lose someone. You don’t have to go through the grieving process alone. In this 13 week course you will cover topics like: Is my grief normal? The journey of grief? Grief and your relationships? Why? What do I live for now? And many others. If you have experienced a loss and are having trouble facing tomorrow, this course is for you. Grief Share provides community with a friendly, caring group of people who will walk alongside you through one of life’s most difficult experiences. 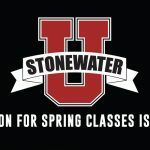 This class is a 13 week class on Tuesdays from 6-8pm. Class begins on February 7th and costs $15.00.